What's New in this Lightroom Release > Lightroom CC iOS/Android Updates > What’s New in Lightroom iOS/Android October 2017 Releases? The mobile apps are members of the cloud-native Lightroom CC ecosystem, so the updated mobile apps use the new turquoise Lightroom CC icon and new terminology (e.g., albums instead of collections). Lightroom Classic, with its desktop-focused workflow, is not a fully-fledged member of the family but more of a distant cousin. Classic continues to sync with the cloud, as it has done for the last couple of years, but no new cloud features will be added to Lightroom Classic. 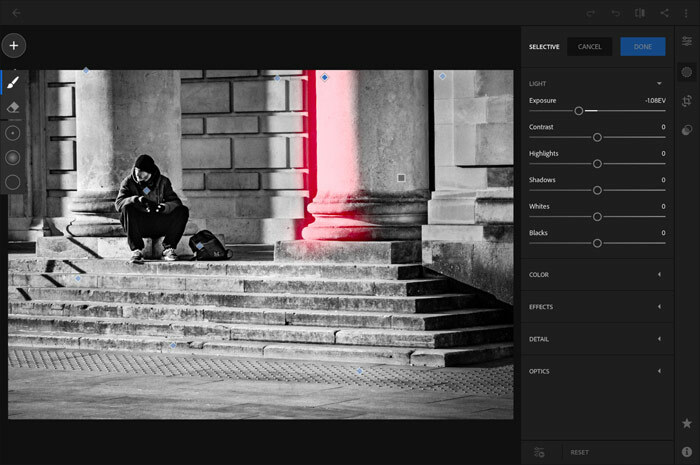 Adobe’s artificial intelligence image analysis technology, called Adobe Sensei, automatically tags your photos based on their content. This means you can search through your photos, even if you never got around to adding keyword tags manually. 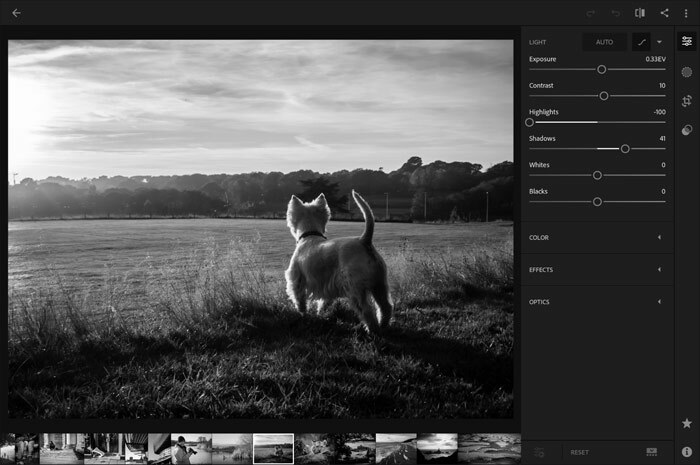 You can search your photos for subjects, such as boats or dog, camera models, dates (October 2017), keywords and a variety of other data visible in the Lightroom mobile apps. 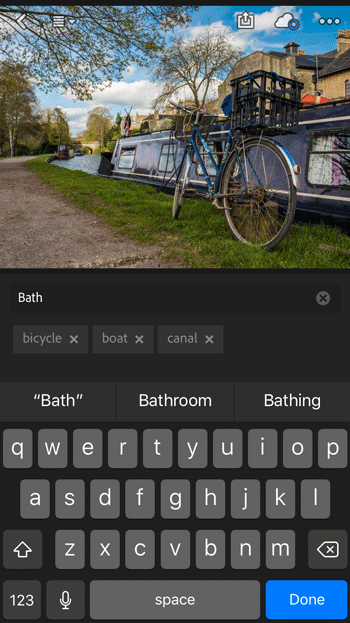 You can now manually add keywords to your photos using the mobile apps, and these sync with the Lightroom CC desktop app (but not Lightroom Classic). Typing the keywords can get a little tedious on a small keyboard, but you can copy and paste them onto other photos or use voice dictation. On iOS, keywords have their own screen, and on Android, you’ll find the keyword entry field at the bottom of the Info screen. 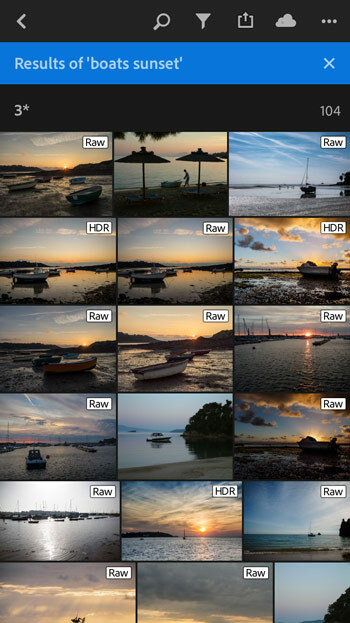 If you’ve been using Lightroom mobile for a while, you likely have a long list of collections. The collections – now renamed albums – can be grouped into folders, which sync between devices and with the Lightroom CC desktop app (but they don’t sync with Lightroom Classic’s collection sets). 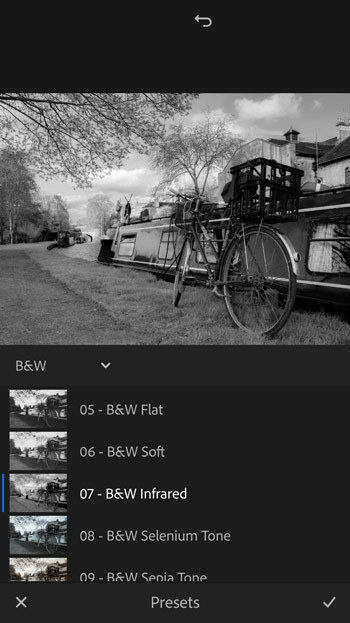 Lightroom users are very fond of their presets, and there’s now a set of brand new professionally created presets for you to play with. The Brush tool allows you to selectively edit parts of the photo. It was added to the iOS version in the last release, and now it’s available on Android too. The Android tablet app now has a new interface to match the iOS and Windows/Mac apps. Previously you could limit sync to Wi-Fi connections only, to avoid using cellular data, but that didn’t help when you were using limited bandwidth networks, such as when tethering or on vacation. Now there’s a pause button, so you can stop Lightroom syncing without having to completely disable Wi-Fi. There’s a bunch of other smaller changes, including bug fixes and minor changes to the user interface, for example, the iPad sidebar is now narrower to make the photo preview larger while editing. On iOS, the minimum operating system is now iOS 10. 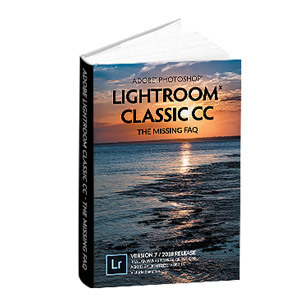 More extensive books for both Lightroom Classic 7.0 and Lightroom CC (Windows/Mac/iOS/Android) will be available soon in eBook and paperback formats, and I’ll let you know as soon as they’re released. I currently have about 5,000 images synced through LR Mobile. Many of these are not associated with a collection and I wish they were as it’s been tedious to try to find them. Prior to upgrading, I’m wondering if it’s best to delete all images from LR Mobile and resync only the collections I want prior to upgrading to LR Classic. Is that the easiest way to ‘clean up’ LR Mobile? You know you can find them in the All Synced Photos collection in the Catalog panel of Lightroom 6 too? 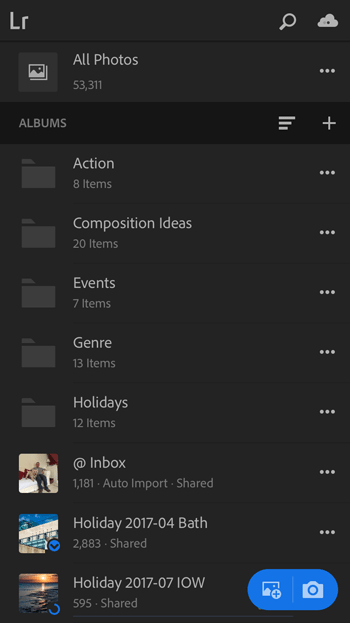 If you just want to remove ones that aren’t in a synced collection, select all of your synced collections in the Collections panel, then select all of the photos. Then without deselecting, select the All Synced Photos collection and go to Edit menu > Invert Selection. Hit delete and it’ll remove them from sync. Jeez, that was simple. Thank you! I even did this in LR Classic using a copy of my catalog. Will edits of smart previews in the new iOS app sync with LR Classic as they did with the previous version of LR CC (now LR Classic)? Yep, nothing’s changed as far as sync to LR Classic goes. That all continues as it did before. Ok! That’s good to hear. Thanks!!! 1. Suppose I am out and about with my Canon DSLR taking some photos (in RAW format) and then I connect it to my iPhone via the USB adapter (or use the Card Reader adapter instead) and copy all the photos over (especially the RAW files). 2. 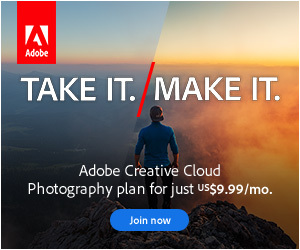 I would then bring up the Lightroom CC Mobile and sync the RAW photo files to the Adobe Cloud. 3. Then once they have synced, I would then delete the photos from my phone’s standard camera roll (not in Lightroom Mobile) to free up space for the next batch. Is this possible and will it sync my Canon RAW files or is there some other workflow to achieve a similar results, which is to copy my files from my camera (or memory card) onto the Adobe Cloud using only my iPhone? Please note that this is specific to Canon EOS 100D Camera and a Apple iPhone 6 (running iOS 11), if the extra details are important! Yes, I work that way with my iPad when I’m on vacation. The only bit I’m not 100% certain on is whether the iPhone 6 can import photos from the card reader/USB, but I’m about 95% sure it can. I have an iPad too but it is an older, slower model (v3 iOS 9). I still have not bought the adapters for the Lightning connector yet (only have the older versions which I used on the iPad), so I will just have to try and see if it works. Just as a side note, I have also found out that the the Microsoft OneDrive app also syncs the RAW files from the iOS Camera Roll, which is probably what I will end up using instead as I currently use OneDrive with my LR (Classic) on a Windows desktop. I was excited – now I’m frustrated (or stupid?). The very top of my wish list was the ‘Pause Sync’ function that you describe – but I can’t find it anywhere! I have LR CC on 2 Android devices (OnePlus 3 phone and Galaxy Tab S3 tablet), and LR Classic on the desktop, and I don’t see the button on either. Should it be there on Android? Doh, I missed that, sorry. It’s iOS only right now, but I’m sure it’ll come to Android pretty soon. The Android developers had more to do this time, so they couldn’t get it done in time. Ah well!!! Too good to be true – I have an African Safari coming up, and it would have been really useful! Long story, but I was having lots of problems with LR Classic crashing when trying to sync. All sorted now – culprit was corrupt image – and now it is syncing again. However, I notice my synced collections are no longer appearing as collections (now albums) in LR mobile (iOS), but are all just dumped in “all photos”. Is that correct, or should they still appear in albums now? Thanks for the update Kerin. I’m not sure how you solved your problem, but in the Collections panel in Classic, double check the collections/albums are still checked to sync. Oh brilliant. I see you’ve put that on the bug report too, which will be really helpful to the engineers. Victoria, what if I already have the whole CC package (full, not the Photography or Lightroom bundle), do I get the 1TB space in the Cloud? The full CC package has 100GB instead of 20GB, and can be upgraded to 1TB. 1) How do you get iPhone RAW photos shot w LR camera from new Lightroom CC mobile into your desktop LR Classic? 2) Not being able to rename in new Lightroom CC on import, in album nor on export leaves a whole lot of meaningless nameded photos with some duplicate names after typical 9999 turnover on DSLRs. 3) I might add to your other page with a choice diagram (which I s quite good) is that if you want to make exhibition prints yoursellf or through a quality print service that the new Lightroom CC (Lightroom Cloud) is not for you with no print module nor any export other than sRGB. Some features the cloud version is lacking may be difficult to implement. E.g. syncing a changed name could cause problems unless they move the previous name into metadata so it exists to find other instances to also change.— unless you are only changing the cloud instance which then appears on all devices. P.S. 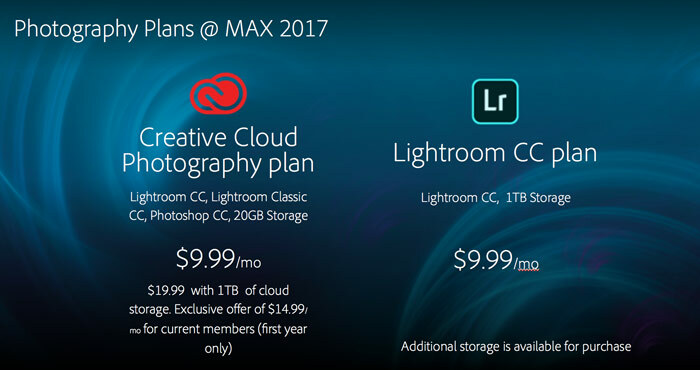 After several years of Lightroom CC meaning subscription Lightroom, why didn’t Adobe call the new application/program “Lightroom Cloud CC” and leave the ‘for now’ Lightroom Classic CC as just Lightroom CC . They could change it to Classic if Lightroom Cloud becomes more powerful later. 1) That’s what sync is for Jak. I’m assuming your iPhone is signed in to your Adobe account, so they’re safely uploaded to the cloud. Then in Classic, if you haven’t already done so, click on the ID Plate (top left) to show the Activity Center and enable sync. 2) Yes, it does. They have unique ID’s behind the scenes in the cloud, so it doesn’t cause a problem in a CC-only workflow.